This page covers the author of The Life and Death of Harriett Frean. For other authors named May Sinclair, see the disambiguation page. Mary Amelia St. Clair was born at home at Rock Ferry in Cheshire, England, the daughter of a shipowner. She received her early education from a governess and then attended Cheltenham Ladies’ College. Her first novel, Audrey Cravern, appeared in 1897, under the pen name May Sinclair. She published two dozen novels, plus short stories and poetry, and popularized the "stream of consciousness" style advocated by Virginia Woolf. She also published the volume of literary criticism entitled The Three Brontes (1912). May Sinclair remained unmarried and lived with her mother until that lady’s death in 1901. She became a founding member of the London Medico-Psychological Clinic in 1913 to help promote the teachings of Sigmund Freud. After the outbreak of World War I, Sinclair went to France to work as an ambulance driver. She was so overcome by the war experience that she returned home to England after 17 days. 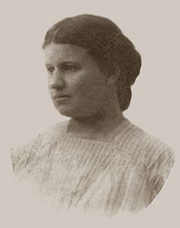 She published articles based on her experiences in the The English Review and a book, A Journal of Impressions in Belgium (1915). "May Sinclair" is composed of at least 2 distinct authors, divided by their works. You can edit the division. May Sinclair is composed of 3 names. You can examine and separate out names.